George Simolaris is a member of the Board of Selectmen (the town council) in Billerica, Massachusetts. 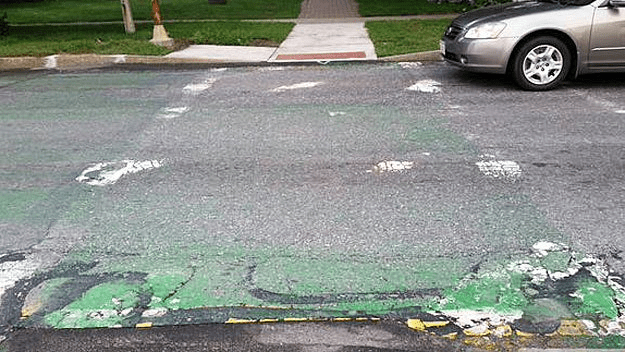 According to him, some of the crosswalks around town have become unsafe because the paint has faded, and it's been taking forever to get the town manager and/or Board to repaint them. After more than six months of waiting, he says, he decided to help, so he went out last week and painted several of the crosswalks himself, at no cost to the city. He even used his own paint. Then they looked nice and were easy to see. For this, he will be prosecuted. Exactly why the rest of the board and the town manager are so unhappy with this is not clear to me. Pictures posted by local news (right, courtesy of Karen Twomey/WBZ News) seemed to confirm that the paint had in fact faded. This, at least, is what one crosswalk looked like after town workers got done power-washing Simolaris's paint off the street. It's possible it didn't look quite this bad beforehand, if the workers stripped off some of the old paint in the process. But it looks that way now. Simolaris used green paint instead of yellow, and he may have used the wrong kind of paint. Supposedly, a resident has complained that some of his paint got onto his or her car, but no details of why or how have been published yet. But even if both those points are valid, I'm not sure why they wouldn't just go paint over the green with the officially approved traffic yellow. Instead of doing that, they sent out the power-washing crew, which cost the town $4,200 and would appear to have made the streets less safe again, at least temporarily. (As of the most recent report, the crosswalks remained unpainted, or maybe de-painted would be more accurate.) They are demanding that Simolaris pay the $4,200 and resign from the board, and they are also pressing charges against Simolaris for "defacing public property." At the board meeting last week, Simolaris refused to resign and according to this report, citizens who attended the meeting were mostly in his camp. Actually, the report says that "the backlash at the other selectmen was hard to contain." For now, the board is standing its ground. I'll try to update this breaking story in the near future.